Sandy Beach is not for the faint of heart (or most tourists). If you are not familiar with Strong shore breaks don’t go in the water here. Look at how much water is behind this wave. When you eat it, you eat it hard.At Sandy’s, there is a wide sandy beach, large grassy fields, and potent winds, which result in some of the best kite flying on the island. 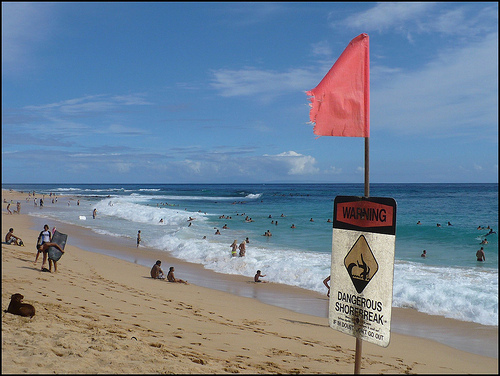 But lurking off shore are some of the meanest waves in all of Hawaii. The waves aren’t large (4-6 feet in the summer), but they come in hard and fast.This makes Sandy’s THE SPOT for Boogie Boarding and Body surfing. But be warned, people have gotten seriously hurt when the wave crashes on top of them and slams them underwater to hit the sand below. But that doesn’t stop the flood of locals on the weekends to try their luck at Sandy’s. 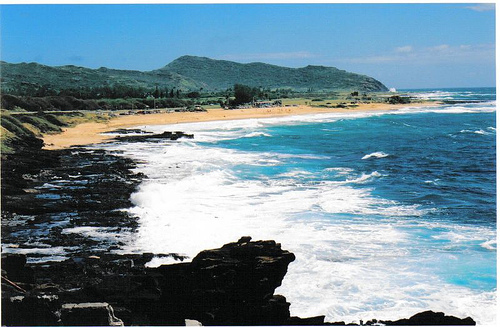 Sandy Beach OCEAN INFORMATION — For a detailed description of the Pacific Ocean’s marine climate, water properties, currents, tides, waves, etc., please visit The Ocean Atlas of Hawaii online. You’ll learn many interesting facts, like our average surface water temperature in Winter is 75 F (24 C) and 81 F (27 C)in the Summer.Call 596-SURF (that’s 596-7873) to hear a recorded message on conditions at various O`ahu beaches. The recording is a free service of the Surf News Network (SNN) and is updated four times a day, 365 days a year, at 7 a.m., noon, 3 p.m. and 7 p.m. In addition to wave heights, SNN provides information on winds, tides, and buoy readings.